Detroit Dough co-founders Daniel Washington, Autumn Kyles, and Victoria Washington. How many of us have ever tried to sneak a piece of raw cookie dough when your mom baked cookies? Thanks to Detroit Dough, you can now indulge in the dough as much as your sweet tooth desires. The team behind this food start-up includes co-founders Autumn Kyles, Victoria Washington and Daniel A. Washington. These three African American millennials from Detroit are the perfect ingredients that make Detroit Dough a sweet success. Founded in June 2017, Detroit Dough sells and distributes edible cookie dough. To make it safe for consumption all traces of eggs have been removed, and the flour used is baked. The company has sold more than 10,000 cups of dough since sells began in November 2017. A testament to the company’s sense of social responsibility, Detroit Dough gives a portion of all its profits back to the neighborhood it was founded in – NW Goldberg by way of its “Dough That Makes a Difference” pledge. Kyles, the chief executive officer, is a member of Alpha Kappa Alpha Sorority, Inc., and previously served as the organization’s International Second Vice-President a position which allowed her to travel domestically and internationally. Through her domestic travels, she saw an opportunity in the food industry that could take her hometown by storm. The company currently offers five flavors including chocolate chip, no chip, sugar, peanut butter and brownie. Contrary to popular belief Detroit Dough is just that, dough. Having only been in business less than a year, Detroit Dough is making strides in the entrepreneur realm. 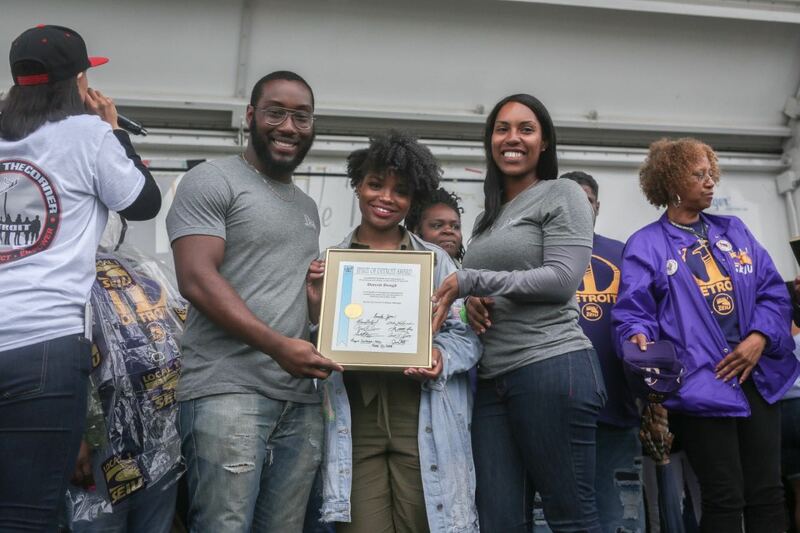 The team’s recent accomplishments include 2nd place winner of the Michigan Women Forward Dolphin Tank Pitch Competition, a member of the latest gBETA cohort and recipients of the Spirit of Detroit Award from Councilwoman Mary Sheffield during the inaugural DON WEEKEND last month. A lot goes down in the DM’s… even business deals. Through a simple direct message on Twitter, chief marketing officer Daniel Washington secured a meeting with Emagine Entertainment, an American movie theater chain with locations in several cities throughout Michigan, Minnesota, and Illinois. As a result of Daniel’s assertiveness, Detroit Dough can now be found in Emagine’s Birmingham, Canton, Macomb and Novi locations. Detroit Dough hopes to be in all Emagine locations across three states by the end of this year or early next year at the latest. Detroit Dough’s current pop-up location is at Esplanade on Woodward, where they are stationed typically six days a week in partnership with XO Detroit’s Downtown Detroit Summer Markets. They can also be found at the Detroit City Football Club home games. According to Daniel, Detroit Dough has exciting plans for the fall that the team is not ready to reveal, but Wolverine fans will be very happy for more reasons than winning football. Stay updated with all things Detroit Dough by following them on Instagram, Twitter and Facebook at @eatdetroitdough and visit them online at www.eatdetroitdough.com.